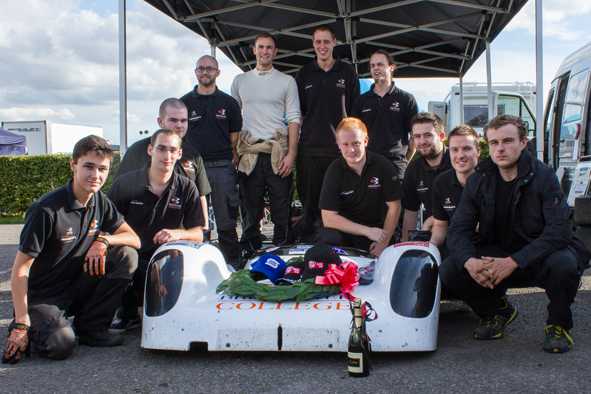 BRIDGWATER COLLEGE MOTORSPORT TEAM: THE 2013 CASTLE COMBE CHAMPIONSHIP WINNERS! The Bridgwater College Motorsport Team took first place in the final race of the championship earlier this month at Castle Combe, Wiltshire, making them the 2013 Castle Combe Sports & GT Champions!! The driver of the car was Josh Smith, the author of our Fundamentals of Motorsport Engineering book and also Programme Manager for Motorsport Engineering at Bridgwater College. His team was made up of Foundation Degree Motorsport Engineering and Level 3 Motorsport students. It’s a fantastic achievement by all of them! This year’s success is the culmination of much hard work, with the Foundation Degree students spending the first half of the year building and maintaining the Radical PR6, with only the second half of the year spent racing. The team qualified on the front row in second place and started the race one point behind their rival team. During the last lap of the 15-lap race, the Radical passed the pole position driver and went on to win, also gaining the fastest lap time. Well done again to the whole Bridgwater team, what an amazing achievement! !